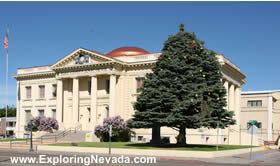 Elko's location guarantees that many travelers in Nevada will spend a night in the city. Since Elko is the only city of any size between Reno and Salt Lake City, numerous hotels and other services that cater to travelers are in Elko. When traveling down Interstate 80, travelers are advised to "not press on" if they don't feel awake enough to reach Reno or Salt Lake City. Elko is the absolutely best place to stop for those "in-between" Reno and Salt Lake City.